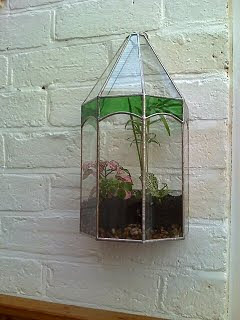 I have seen little bubble-looking wall-hanging terrariums which are all well and fine. But THIS stained glass wall hanging terrarium from Gryphon Stained Glass takes the cake! It actually looks like something I would want to hang on the wall and appears sizable-enough to accommodate some real plants. thanks for the kind words, terrariums don't get enough attention these days. Hi Kevin- thanks for the great feedback. Please keep me posted if you create any other terrarium-friendly glass works. I'd love to keep posting them!